I have a confession to make. I'm not a fan of granny squares. For some reason I have yet to figure out, they annoy me. The first few rows are fine, but the never ending grannies just don't do anything for me. However, square blankets fascinate me. I love the idea of working in rounds that join and color change effects are equally satisfying. Last year, one of my favorite blankets I made was based on the idea to create V stitches using dc2tog, the double crochet together stitch. Instead of the traditional double crochet - chain- double crochet, the dc2tog V stitch blanket creates the Vs based on the side by side dc2togs. It's really cool. What is even better is the happiness that comes from making those darn dc2togs! They are addicting and I find myself staying up later and later working on those blankets. I saw a different blanket created by a designer using this method of straight rows of V stitches, but I wanted to try my hand at making a square blanket using the dc2tog stitch. I am so in love with what I came I came up with and I hope you like it, too! You can use this pattern with any weight of yarn, but I recommend going up a hook size from the one on the skein wrapper. It makes the blanket stretchy, luxurious, and lacy. You could also use the hook size recommended by the yarn and you will get a denser blanket. This blanket would also be great with scrap yarn! Rows 4-27: Continue the pattern as directed in Row 3 for each additional row. Alternate colors so that your wobbly squares are visible. Finished size at gauge: about 36 inches. I chose not to add a border to my blanket, but feel free to add one to yours. Thanks, Chelsea! It is funny you ask this because it is an idea I have been pondering. I'm going to work on a rectangular foundation and see if I can get it to work. Thanks for the challenge! 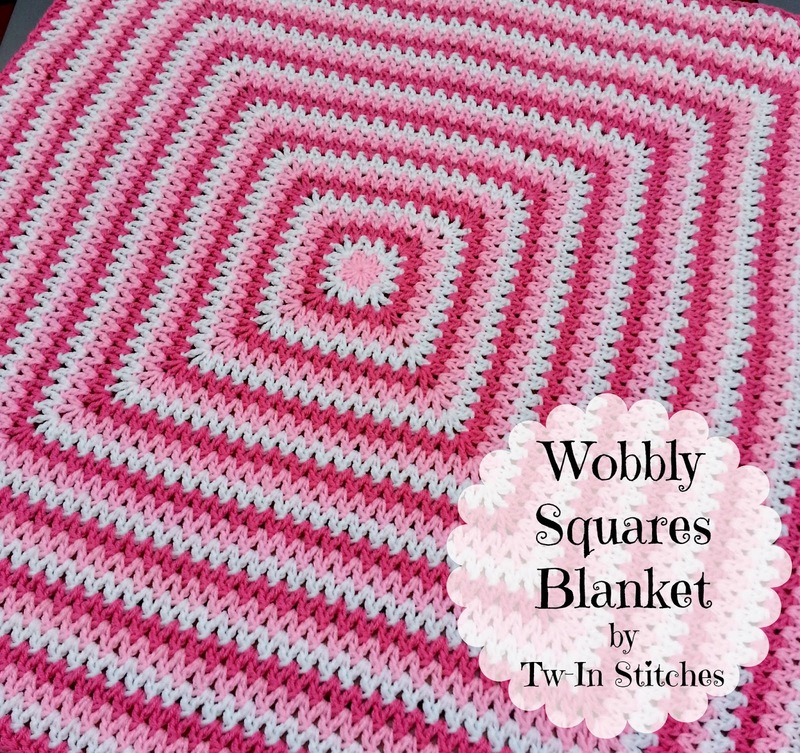 The Wobbly Rectangle Blanket is now available! Thanks! I was just going to ask for the same thing. I'm off to get the rectangle one. Happy hooking! 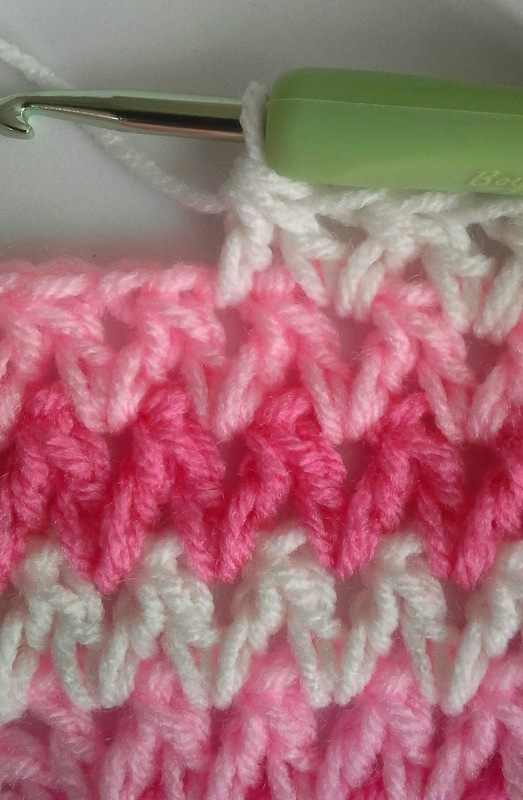 Do not have a pattern for it but just by adding extra stitches along two sides, (across from each other)will form a rectangle instead of a square. I found a link for a regular granny square rectangular blanket. I am sure you could follow the stitch count for it with this pattern and get the rectangle. -- Rectangular Granny Blanket, free pattern by Bernat Design Studio. Very pretty! Do you have a chart for this pattern you can share? Hi, Marie! I am still working on my charting skills. I am considering creating a step by step picture tutorial if you think that might be helpful! LOVE your pattern & thanks for sharing! The only daunting part for me is the weaving in of all the many ends with each row/color change being a fasten off. Other than that I am thoroughly enjoying this! Mary, that is the only drawback, for sure! The good thing is that it looks so beautiful in the end, it makes it worth it! I'm so glad you are enjoying it! What's the measurement of your blanket when finished? I'm just starting this and noticed it wasn't put in. Sorry, Erika! At the gauge written, 27 rows gave me just shy of 36 inches. Would you consider doing a video tutorial of this blanket. Hi! I wish I were set up for a video as a possibility. I only share written patterns at this time. I agree a video tutorial would be great! It's so beautiful. I didn't add a quick video to learn the stitch. I tried making a hat with the DC stitch and it was so hard. There is a link to a photo by photo tutorial of how to do each row. You just need to click the link above. 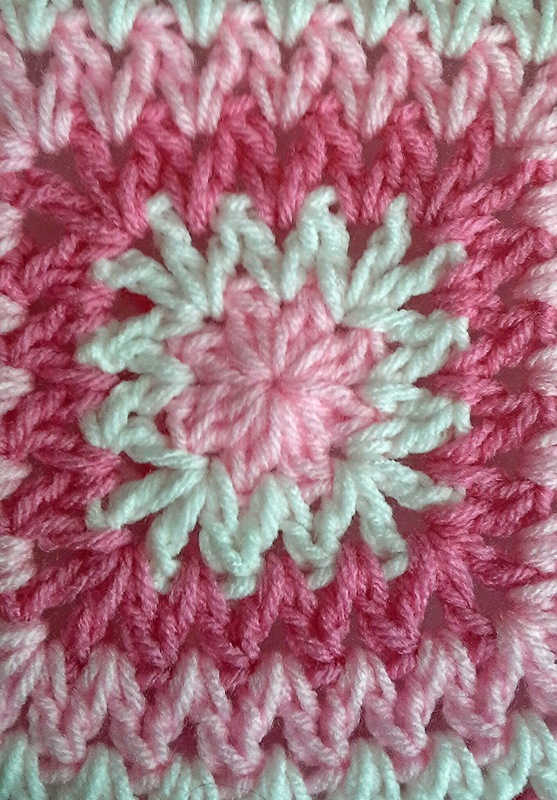 I love this pattern in the square and rectangle but I would like to do it all in one colour. I can't however work out to get from one round to the next with out it looking obvious. Please could you help? Hi, Frances! I have done it in one color. There's a trick that I use, but I'll have to go home and look at the square that I made. Maybe I will do a post on doing the square in one color just for you! Give me a few days, though! Wow, that's brilliant. Thank you so much. I look forward to finding out what this trick is. Hi Jennifer, I don't suppose you managed to find out how you did a blanket in one colour? My sincerest apologies. Life has been hectic and I dropped the ball on your request. I will go home tonight and write up the alteration for you! Oh that's brilliant thank you so much. I completely understand how life can be so hectic. I've just moved house! Just found you thru Pinterest. Love this & can't wait to give it a try. Thanks! I'm so glad! I'd love to see a picture! I just finished mine, 64" square. Wish I could post a photo! You can always post it on Ravelry! If you look back up at the top of the pattern, you will see that there is a link to a photo tutorial of the first three rows. Found you thru pinterest. I absolutely love this blanket! The pattern is so quick and easy to work with a beautiful result!! While I decide on the yarn, do you think this would work using varigated yarn or should I stick with solids? I love how it came out. The Wobbly V-Stitch is really versatile! Hi, I would love to make this pretty blanket but for some reason it wont print out. I have tried twice. is there any other way to get this pattern? I was able to print the rectangular one. Thank you for sharing your pattern. If you copy the URL and go to www.printfriendly.com, you can paste the URL into the box provided and it will generate a printable copy of the pattern. I loved this pattern so much I actually kept going and made it 37 rows, gave me a perfectly sized blanket to cover up on the couch!! I'll be making another couple of them next for some Xmas presents, thinking of adding a border but can't decide on one lol! Thanks for the great pattern!!!!! I'm so very glad you liked it! It's one of my favorite patterns. Please share your pictures on Ravelry. I'd love to feature them. Do you have this pattern in pdf format please? Hi! I don't, but you can make one on your own. Copy the URL of this page. Go to www.printfriendly.com and paste the URL into the box. Follow the onscreen instructions and voila! Will it be possible to make this pretty pattern in rows as well? Can I make the rectangle one with this pattern?? I have a pattern for the rectangle, too! 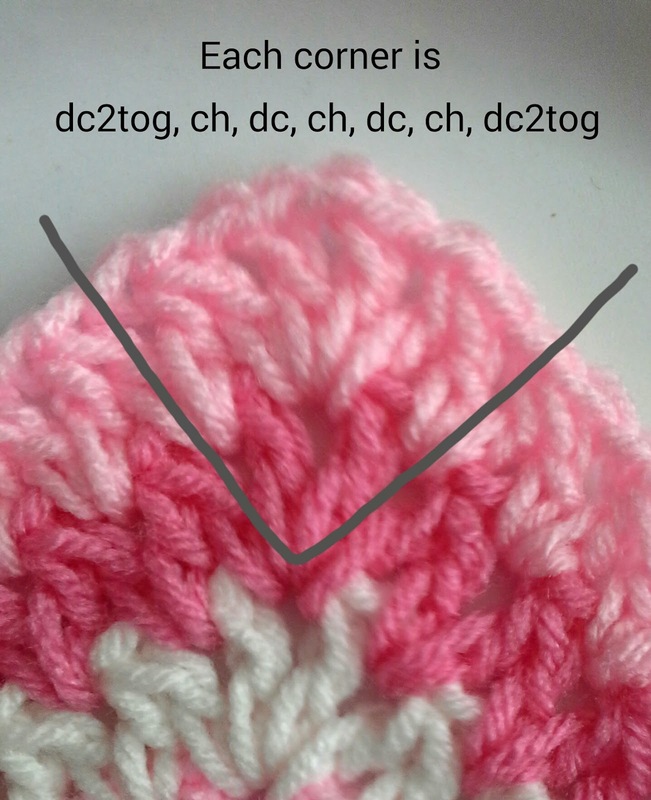 I'm a little confused at you dc2tog - are you doing a decrease or are you doing 2 double crochets in the same stitch? I have not tried the pattern yet - but just reading it does not make sense to me - it looks beautiful! I always seem to want to make hings more complicated! lol I would like to do multiple rows in the same color before changing. What is an easy way to do this without using both of your patterns for single color and this one? How do you do the magic circle. Are the 8 dc2tog and chains the magic circle. If so how do you do it when you only have 2 chains? Can you do a picture tutorial like the other rows in how to do the magic circle?